So last night was Tuesday, and Tuesday is date night. Now usually this just means we go to a movie or do something special together, but last night, we kicked it up a notch, so to speak. Aside: When we were in London a few months ago, our hotel was RIGHTNEXT to the Wicked theatre. I really wanted to go, (I may have whimpered a bit), but the tickets were outrageously expensive and we were at the end of our two week European honeymoon and didn’t really feel like dropping several hundred pounds for a show. We saw Avenue Q instead and it was awesome. But I still wanted to see Wicked. Fast forward a few months. I start seeing signs on buses, hearing ads on the radio…Wicked was coming to Seattle! Yay! (Insert happy dance) Naturally, I bought us tickets as a sort of early birthday present for me, and scheduled it on date night. So last night, I came home from work kinda cranky and tired, but changed into a pretty dress and we headed out. And then it rained. Not like normal Seattle drizzle, but full on, BUCKETS. Of course, we’re Seattlites, we always have our raincoats….right? Hm…not this time apparently. The show was MAGNIFICENT! I’m kind of a musical snob, and I loved it. 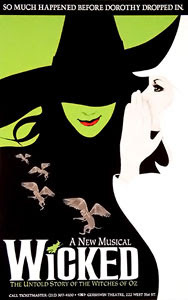 I was a bit apprehensive when we arrived and found out from our program that the understudy would be playing the role of Elphaba, but I need not have worried. This girl blew the roof off. The set was intricate and ever changing. The choreography was well timed and crisp, and the vocals were out of sight. “Defying Gravity” was probably the highlight for me. Could I ask for more? Well, maybe a pair of jeweled slippers? You are currently browsing the archives for the date category.